This is a re-print of The Archive - Journal of the Northside Folklore Project, Issue 4, Jan 2000 pp.5-8 converted from PDF to HTML. Thanks to Stephen for permission. "Won't See His Like Again"
With over 30 million record albums sold worl-wide, Rory Gallagher ranks as one the most famous figures ever to be associated with Cork. One of the first Irish rock acts to enjoy major international success, his stature as an instrumentalist and singer/song-writer in the blues and rock fields is assured. Courtesy Seán Leahy, Leeside Music, MacCurtain St.
And did he speak to you again? I never met Rory. I saw him twice in concert, in 1980 and 1991. Both were electrifying events. 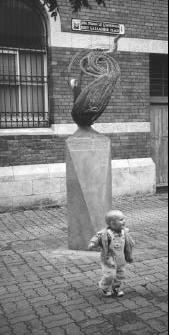 I hope here to provide a few glimpses of the man through the eyes of Cork people who remember him from his earlier days, and to talk briefly about the nature of his art and genius. Blackpool's Mick Moriarty (The Baldy Barber) recalls him from the period of his rigorous teenage apprenticeship in The Fontana (later The Impact) Showband during the mid-'60s. "He was instantly recognisable, with his long flowing locks, walking across Patrick's Bridge with his guitar. At that time he was playing in the evenings after school." Mick O' Leary, originally from the nowvanished complex of lanes around Blarney Street, remembers Rory's gradual ascent to stardom. "He was in the Fontana and he wasn't playing blues, the nearest would have been some Chuck Berry songs." Rory revamped the Fontana into The Impact Showband, which eventually broke up in Germany. He then formed Taste with Eric Kitterihgham and Norman Damery of The Axles. Mick continues: "I saw them in the Cavern in Leitrim Street, the Shandon Boat Club and the City Hall; mostly small audiences. They were very exciting, mainly raunchy rocking blues. One night the band held a kind of informal poll among the audience at the City Hall as to which of four songs they should release as their first single. `Blister On The Moon' won it, being released on the small `Major-Minor' label, with `Born On The Wrong Side Of Time' the `B' side. Another of the four songs was `Pardon Me Mister', which to my knowledge has never been released anywhere." Richard McCracken (bass) and John Wilson (drums) were later recruited so as to secure a recording contract with Polydor. There was more than a nuance of jazz to Taste's music, with Rory's busy expressive saxophone playing earning him the soubriquet "Yakety Sax". The trio developed a larger following at Belfast's Maritime Club, then secured a residency at the Marquee Club, Wardour Street, London. Mick had moved across the water, and went to see his fellow-Corkman perform. "I'd known Rory to say hello to. That time in Cork you had an affinity with just about anybody with long hair. You were very much a minority. John Gee, manager and M.C. at the Marquee, would announce `Rory Galla-g-her' ­ with a hard `g' sound, `From Belfast!" ­ And we'd all shout `Galla-h-er, from Cork!' One day I was sitting in Piccadilly Circus with Patsy Twomey, a Cork lass, who called out to him as he passed by. He came over and we talked. I met him after a couple of Marquee gigs, but never spoke to him much, I'm sorry to say. A lot has been made of his shyness, but he was also a determined strong-willed man; in that business he had to be. He was a great musician and performer, someone Cork should be proud of." Another Northsider, Dolores Quinlan, was a shop assistant in Eason's Patrick Street premises during the mid '70s, when Rory, now a London-based star, would make return trips to his hometown. "We would see him going upstairs to the record department where Sheila MacCurtain (daughter of Cork's republican Lord Mayor Tomás MacCurtain) worked. We would know through eye-contact where he was going. We'd make excuses to go there, then follow him downstairs when he went to get his New Musical Express magazine. He always had the correct money, so we never had to give him change. We'd all be giggling to each other, but he was oblivious to all this. I never tried to strike up a conversation with him, although he was unfailingly polite and friendly. We even knew that he went to 6.30 Sunday evening Mass at Saint Augustine's on Grand Parade with his mother, so we'd go there too." Seán Lucey, founder of the Dixies Showband, shared a plane ride from Cork to London with the young bluesman around 1974. "I was travelling with a guy named John O'Connor, who was going to audition for the job of singer in our showband." John got the job, and as a consequence of the meeting changed his stage-name to Rory O'Connor (coincidentally also the name of Ireland's last independent High King), which he thought had a more striking ring to it. Seán continues: "Rory had paid for two seats and kept his guitar in the one next to himself. `This is my baby', he said jokingly." Rory's solicitude towards the instrument was well-founded. The battered 1961 sunburst Fender Stratocaster, for which he had paid £100 in Crowley's music shop (then on Merchant's Quay, now in MacCurtain Street) in 1963, was once stolen from him, and against the odds, returned. It became a celebrated trademark. A truly modest man, his dress-style of boots, blue or black denim jeans and tartan-patterned lumberjack shirts with button-down pockets ­ the practical and comfortable attire of working people ­ reflected his complete lack of pretension. At a subliminal level the tartan may have conveyed a broad sense of Celtic identity. Rory declined an offer to join, "the Greatest Rock 'n Roll Band in the World", The Rolling Stones, after the departure of Mick Taylor in 1973, although he recorded with them for a few nights. Later there were recordings with boyhood idols Muddy Waters, Albert King, Jerry Lee Lewis and skiffle king Lonnie Donegan. Taste's split came at The Isle of Wight Festival in 1970, with the trio staying together until the end of the year to complete some engagements. 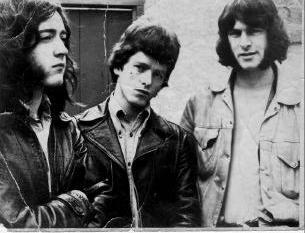 Early in 1971 Rory produced his first solo album and recruited Belfast men Gerry McAvoy (bass) and Wilgar Campbell (drums) as his backing band. 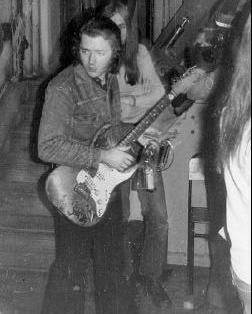 With the intermittent addition of other musicians, especially keyboardists and Mark Feltham on harmonica, "Rory Gallagher and his Band" encompassed a great variety of styles and influences throughout the 16 magnificent albums that followed up until 1994, generally exhibiting a fuller and somewhat harder-edged sound than Taste. Both outfits presented fine reinterpretations of American blues songs, sometimes performed by Rory in a solo context, such as his steel-bodied National guitar reworking of "Gambling Blues" at the 1969 Montreux Jazz Festival, or his rendition of Blind Boy Fuller's "Pistol Slappin' Blues." His reshaping of the Louisiana singer Leadbelly's (Huddie Ledbetter, d.1949) "Out On The Western Plain" made a big impact at concerts. This had been a youthful favourite and benefits from a felicitous marriage of Black American and Celtic influences. Instead of the standard EADGBE tuning, Rory's Martin acoustic guitar is pitched DADGAD, based on a Celtic bagpipe tuning, giving it a plangent, chiming effect. Other country blues, like William Harris's "Bullfrog Blues" or Bo Carter's "All Round Man" were updated and presented in a more rocking context by the full band. There were exciting treatments of modern city blues classics, including Junior Wells's "Messin' With The Kid" and Sonny Boy Williamson II's "Don't Start Me To Talking." His rendition of white country singer Hank Snow's (1910-1999) "I'm Moving On" invites interesting comparisons with versions by The Rolling Stones and George Thoroughgood. But his own compositions comprised the bulk of his material. These inventively extended the boundaries of blues-based music in terms of chord patterns, verse structures and lyrical content. His lyrics are masterly in their descriptive power and expressive range, although to remove them from their musical context does them less than justice. They are essentially Romantic in origin, in the sense that they suggest a world of adventure and possibilities lying in wait at our doorsteps, of everyday reality transformed into a more magical dimension. They draw extensively on the folkloric motifs typical of the vast open spaces of North America, almost, I would suggest, an America of the mind. A land of mythic characters and boundless opportunity, a fabled realm that beckoned to people on this side of the Atlantic (and one is tempted to say, beckoned with particular appeal to the inhabitants of this island) with promises of freedom and affluence. Often these lyrics seem to refer back to an ethos that is 19th.century in origin - without being dated or indulging in trite nostalgia - to an era of expanding frontiers and the dawn of social emancipation. Yet they are also modern, readily understandable in terms of the society around us. And even when they are imbued with menace or hints of violence (a frequent stance or device in blues, and one not always to be taken too literally) they never descend into the misogyny or other antisocial brutalities of some contemporary rap music. In line with blues tradition, they bewail the cruelty of fate and the unfairness of the human condition. They celebrate outlaws and other outsiders and are leavened with just enough wry humour to prevent them ever collapsing into bathos. Looking like survivors from the lost and found." "Kickback City", "Smear Campaign" and "Loan Shark Blues" contain more specific elements of protest. "Failsafe Day" deplores the 1980s build-up of nuclear weapons. "Daughter Of The Everglades", "Shadow Play" and "Moonchild" convey feelings of ethereal fantasy. There are unsentimental love songs, such as the haunting minor-keyed "Just The Smile". Better get used to being my used to be!" Like most great artists, Rory seems to be holding back just enough of himself to distil a sense of something mysterious about the whole creative process which transcends the merely personal. He operates from within a strongly-founded tradition with great assurance, so that these songs attain a type of classicism and become truly the joys and sorrows of Everyman and Everywoman. We feel we can hear him saying something like "Yes, I know life can be lousy and that you're hurting. I've been there too. But listen to this awhile and we might both feel better..." His great technical virtuosity, the product of years of application, enabled him to create an aura of high showmanship, but it was always at the service of his message, of the need to communicate, not an end in itself. One notable characteristic of his playing is its warmth.He might unleash an explosive flurry of growling, bent notes, yet there always seems to be at the back of this a sensitivity, a kind of aesthetic precision that prevents his work ever straying into the more self-indulgent reaches of heavy metal. His playing is often intensely vocal, seeming to answer and mimic his own singing, yet he is also capable of creating marvellous abstract constructions that are challenging in their complex symmetries and intensely satisfying in their resolutions. He hammers on the instrument in a driving percussive manner that evokes the no-holds-barred physicality of a barrel house player of the 1930s, or he can just as readily execute a bouncing ragtime or folk-influenced piece with the lightness of touch of a Segovia. With a deep understanding of the potential of various "open" tunings, where the guitar is tuned to automatically produce the notes a particular chord when strummed, he became a renowned exponent of the "slide" or "bottleneck" style of playing which this facilitates. 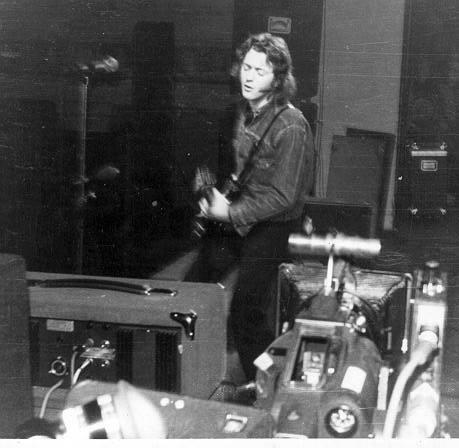 And always there is space, space between both Rory's guitar phrases and the different instruments in the band; light and shade; a realisation that exciting as volume may be, it is ultimately only another tool to be employed and that the last thing the listener needs is to deluged by an unrelenting wave of sound. He was fortunate to enjoy the services of many fine musicians. A constant from 1970 to 1992 was the bass-playing of Gerry McAvoy ­ driving, fluid, empathetic and utterly dependable, it was the perfect foil to the guitar-master's pyrotechnics and the bedrock to which the band's sound was anchored. Eddie "Son" House (1902-1988) was a type of artist who appealed mightily to Rory. Rising above a background of poverty and institutionalised racism, he succeeded in creating for himself a life of great spiritual and artistic richness, if only of modest material success. A man of innate dignity and kindness, his personality possessed a kind of authenticity that by comparison makes the arrogant posturing and brat behaviour of media-created celebrities such as boy-band members and super-models seem all the more shallow and nasty. Rory felt a great debt to Son and others like him, transmuting their music and presenting it to an audience of millions. In a recent illuminating talk for RTE radio entitled "Giant At My Shoulder", film-maker and musician Philip King summed it up thus: "This music is not something that is `fashionable' or disposable, it's something that is there forever. He carries the music from one generation to the next. The heart and the soul that beats in the music still beats on, even though Rory himself is gone." I attended Rory's funeral at Bishoptown's Church of The Holy Spirit on a damp afternoon in June 1995. 2000 mourners packed the church and hundreds lined the streets outside. Walking back to the city through a warm screen of summer rain, I reflected on the nature of his achievement, as well as the mystery of a life cut short. Wailing at the brassware, call him "Yakety Sax"
From 1996 to 1998 Carlsberg beers, (a franchise of Guinness Brewers), sponsored "The Bowling Green Festival", a June Weekend blues festival based around a number of Southside Cork taverns, honouring Rory's memory. The driving force behind this was Mick Healy, of "Mojo's Blues Bar". With his retirement the event has been discontinued. Let's hope that someone will see fit to take up the challenge of reviving it in the Millennial year, here in this great artist's native city. For truly, we are not likely to see his like again.